Oliena is the heart of Barbagia, at the foothills of Supramonte, where the Nepente wine tastes like the “nectar of the Gods”. Oliena is a charming town of the Barbagia region at the feet of Supramonte, Sardinia’s main mountain mass. From its highest peak, Monte Corrasi seems to protect the town, one of the most characteristic in the Nuoro province. A town alive with traditions, customs, culture and that guards the secrets of making the Nepente wine. A town also dear to Grazia Deledda, Literature Nobel prize winner in 1926, who often took long walks around the town’s little streets. The historical town center still preserves some typical houses, low and with granite on the surface, which during the full moon sparkle with a thousand colors. 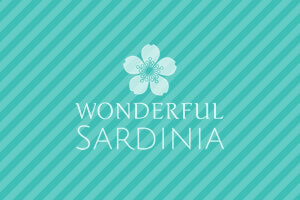 Awarded the Bandiera Arancione (Orange Flag) by Touring Club, Oliena testifies to the fact that tourism in Sardinia can be all year long: 11 Churches to visit and a territory, the Supramonte, that offers many attractions for those who love hiking and trekking along breathtaking landscapes. Inspired by the “slow” tourism of the Barbagia area, the first thing to do is take a stroll around town along the little alleys that cross the main street. Houses still have the original structure in raw granite, small alleys wind their way up and allow you to see tiny doors typical of Sardinia’s low houses. Walk towards the edge of town, where the houses have not been renovated yet and you can appreciate the old walls and paints. In the boutiques that sells local products you can appreciate the art of lacework, wood inlay and weaving (the Jesuits introduced the breeding of silkworms), especially during the many festivities that attract many visitors to town. Among the main celebrations and events we recommend: “Oliena in fiore” (Blossoming Oliena), which takes place in June, “Cortes Apertas” during the fall, “Primolio” to celebrate the new oil in November, the Carnival of Oliena, and above all we recommend to visit Oliena during the celebration of the rites of the Holy Week, during Easter, when you can hear the old chants called “Gosos” and “Cuncordu in Uliana”. For wine enthusiasts, especially of Oliena’s Nepente wine, we recommend a visit to Oliena’s Cantina Sociale (Social Vineyard) and to private vineyards such as Gostolai and Fratelli Puddu. Don’t forget to try the typical sweets of Oliena, which, like many other towns in the Barbagia area, boasts an unmatched tradition. Oliena’s most popular celebration is the Festivity of San Lussorio, which was mentioned already back in the 1800s in the work “Sardinia’s Cities and Villages of the 1800s” by Angius/Casalis. During this celebration the town transforms itself, thanks also to the returning emigrants and the presence of tourists, and is alive with singing, dancing, acrobatic displays, typical Sardinian games like “morra sarda” and lots of wine. Last but not least, if you are on holiday in Oliena or the surrounding area and love gourmet food do not miss a meal at the Masilonghi restaurant. Strolling around town you can visit, among other monuments, the Church of San Ignazio founded by Jesuits and the ancient parish of Santa Maria, the two biggest churches in a town that boasts 11 religious buildings. Inside the former College of S.Ignazio you can admire the altar piece of San Cristoforo, attributed to the Master of Oliena of the 16th century. Strolling around town you can admire also beautiful graffiti, collective paintings often linked to social issues that throughout the years have come to embellish the town’s streets and walls. Another must-see attraction is the kars springs Su Gologone, just a few kilometers from town. Spectacular, transparent, fresh and clean, at the foot of Oliena’s Supramonte, water erupts out of kars springs to create a stream that feeds the river Cedrino. The fracture in the rocks from where the water springs has been explored to a hundred meters depth. Downstream of town, along the road to Dorgali, archeology lovers must absolutely visit the Nuragic complex of Sa Sedda de Sos Carros, where you can admire a small temple and some sheds of an ancient Nuragic village. 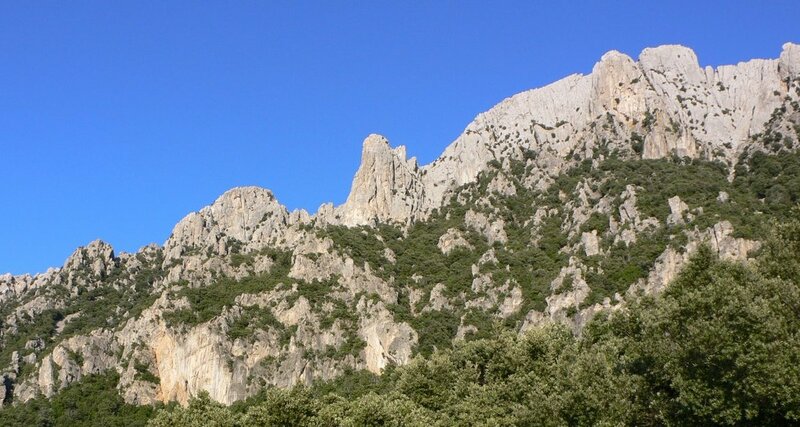 The mountain is Oliena’s main attraction: .Oliena’s Supramonte,a fascinating mountain range for you to explore that reaches almost 1,500 meters with the Corrasi mountain. Sardinia’s Dolomites consist of 3,500 hectares of wild nature, initially explored by shepherds, and the pioneers of modern trekking, and by ancient Sardinian people who left many traces up to today. In the valley of Lanaittu you can explore the caves of Sa Oche and Su Bentu, connected by a siphon. They are considered the biggest caves in Europe. Halls, tunnels and fantastic sceneries for you to explore amid the valley’s wild nature. The Valley of Lanaittu is a beautiful valley that was probably the original riverbed of Rio Flumineddu, the river that goes from Dorgali to Su Gorruppu. This cave derives its name from the bandit Giovanni Corbeddu who used it to hide when he was a fugitive in the 1800s. The cave, temporarily closed to visitors, is of great archeological interest as it shows traces of human activities dating as far back as 10,000 b.C. The ancient Tiscali village is one of the most visited attractions of the Supramonte mountain range. It is an old Proto-Sardinian village inside a doline of the Tiscali mountain, about 600 meters high. The village dates back to the last period of the Nuragic age, around the 6th-5th century b.C. It remains hidden until you reach the inner part of the doline. Su Suercone is a natural monument, an enormous karst valley caused by the collapse of an underlying cavity, or cave. 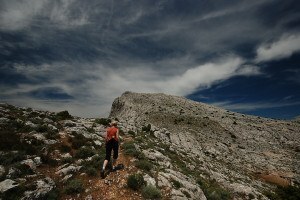 It can be easily reached by the path that goes to Tiscali from the Valley of Flumineddu near Dorgali. At about 900 meters above the Doniacoro highland, the cavity reaches its lowest point, about 500 meters above sea level, creating the greatest doline in Europe. It is a perfectly round sinkhole that looks like the dimple of a huge golf ball. Venturing into its depths is quite an amazing experience, in the heart of the Supramonte, where wild nature, local rare species and traces of ancient bones make for one of the most unique and fascinating hikes.